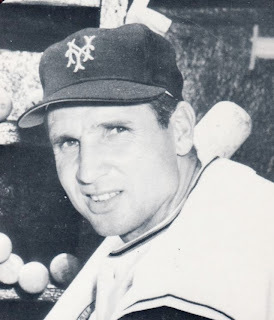 Before he hit the most famous home run in baseball history, Bobby Thomson was the starting CF for the New York Giants. I know he hit fame when he was a 3rd baseman, but Thomson had a few really good years before Willie Mays took over the job permanently in May of 1951. Good thing Bobby was versatile. There are no amazing stats that jump out. 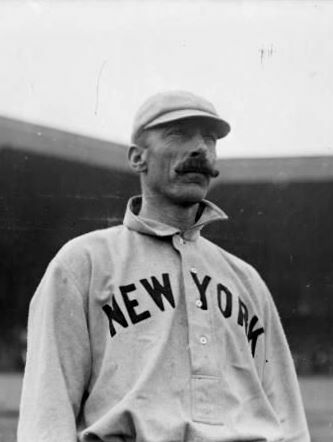 Thomson was a three time All Star with the Giants. I know he wasn't in CF as much anymore but in 1952 Bobby led the NL in triples. Four times he had over 100 RBI in a season. The "shot heard round the world" wasn't a fluke. Thomson could hit the long ball. During a 7 year stretch, he hit over 24 HR's 6 times. Thomson goes down in history for 1951, before that he played a pretty damn good CF. This guy is in the running for best moustache. I mean look at that thing. It's glorious. The jersey with the collar just dignifies that facial hair. I love it. Oh yeah, George Van Haltren could play baseball too. I really don't know how this guy isn't in the Hall of Fame. But that's for another time. He was one of the best outfielders at the turn of the 20th century. George Van Haltren spent 10 years with the Giants. During that time he compiled a .321 batting average, with a career high .351 in 1896. Back then they didn't play the 162 games that they do today. Had George played a 162 game season he would have averaged 209 hits per year. He drove in runs too. In 1894 and 95 Van Haltren had over 100 RBI. The 1896 season saw him lead in triples as well. Somehow as he got older, he got faster. Van Haltren led the league in steals at age 34. He may not be in the Hall, but George Van Haltren was the best the Giants ever had in CF until Mays came along. I could just leave this blank. It wouldn't make a difference. 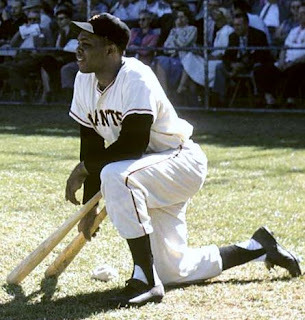 Willie Mays was quite simply the greatest to ever play the game. I know others would say Ruth, but I'm biased. Willie could do everything on a baseball field, and do it better than anyone else. He possessed every attribute you could want from a baseball player. It wasn't just talent either. Willie was one of the smarter ballplayers to play the game. Yes I grew up on stories of Mays. Yes my dad had quite a collection of Mays stuff that is signed all over the basement walls. So I grew up surrounded by him. Many say he was the best they ever saw, and the numbers pretty much back that up. There are so many moments and memories. There is "The Catch". Iconic photos of the "Say Hey Kid" playing stick ball in the streets of New York. Willie running full speed and having his cap fly off. These are pictures captured forever in your mind. He justified all the love. Willie Mays played in 22 All Star games as a Giant. He was Rookie of the Year in 1951, and won the MVP in 1954 and 1965. Yes, 11 years apart. The Gold Glove did not exist until 1957, Willie still managed to win 12 as a Giant. He won the batting title in 1954 and had 336 stolen bases. In fact, Willie led the league in steals every year from 1956-59. His 646 HR's are the most in franchise history. Mays wasn't just power, his speed helped him lead the league in triples 3 different times. I grew up being spoon fed Willie Mays. My dad loved him, and even without seeing him play, I love him too. For my whole life 24 has been my favorite number. It honors the greatest of all time, Willie Howard Mays.